We are talking a soft and bouncy baguette that means you can bite into it without ending up with a sore roof of your mouth or being left unable to speak for ages whilst battling through it. There is a mild sense of warmth to the baguette itself that at least gives the impression of it only just coming out of the oven (even if it is just the way that they store them). The bacon is well cooked and hot but without being left there for so long that it has become a dry or crusty mess and it is further helped by only a small amount of fat being present on each slice. 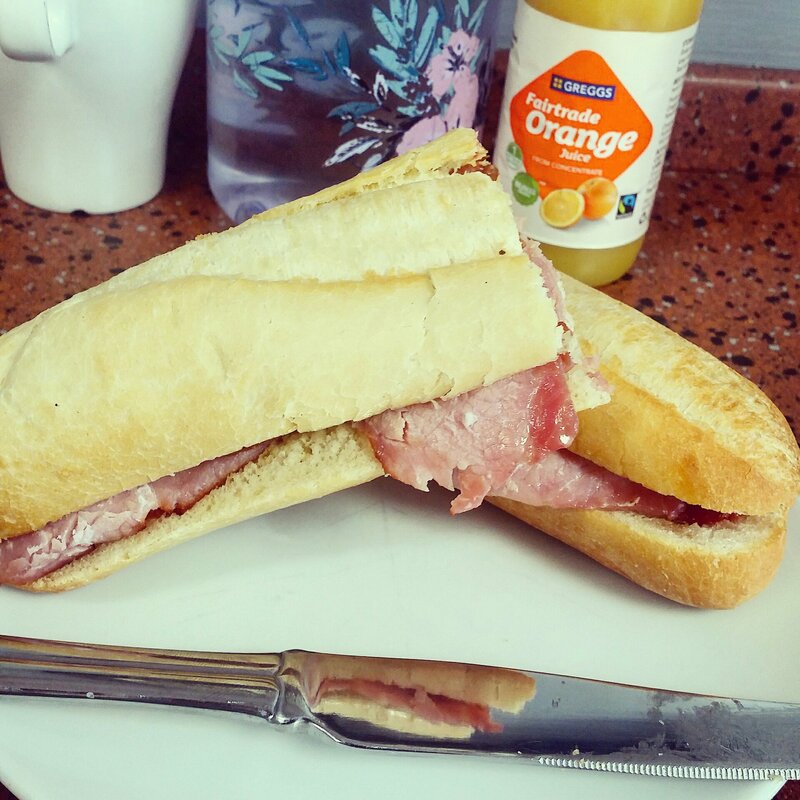 You get a reasonable amount of bacon to bread ratio though if you are keen on a packed filling you can add additional rashers or other items (sausages or egg) to your baguette for a small additional fee. It comes as a deal as well allowing you to have certain hot drinks or a juice with it and if you need a bit of bacon in your life one morning then it probably means that either a cup of coffee or a healthy dose of orange juice will be just what you are looking for. The orange juice is not the best as I tend to find it to be overly sweet but it still manages to provide a level of refreshing ‘ah’ to the start of your day. My biggest issue was that they did butter the bread without asking and that they put the sauce onto what can only be described as the hinge of the baguette rather than on top of the filling but it was actually a tasty enough breakfast item and certainly wins for me over a refrigerated supermarket breakfast sandwich! It is not something that I would go to everyday and there are certainly other spots where you can get a good breakfast item from but if you are in a rush, especially here in Croydon, and it is only just clocking 8am as you head to work this can be a real lifesaver (especially after a long night on the wine). What is your favourite thing to put into a sandwich for breakfast? I tend to like a fried egg and bacon but only if I am eating it inside where nobody can see me splodge fried egg all over my chin or where people can make childish comments about the egg smell! This entry was posted in Food and Drink, Product Reviews and tagged bacon, Baguette, breakfast, breakfast food, croydon, Drink, eat, eating, food, food blog, food blogger, food bloggers, Greggs, hangover, hangover food, life, Lifestyle, lifestyle blog, lifestyle blogger, lifestyle bloggers, meat, options, orange juice, product review, Restaurant review, review, Sandwich, vitamins. Bookmark the permalink.